Looking for the cheapest possible Mumm Champagne? Compare current prices, exclusive vouchers and look into the Price History of each product to make the best choice. 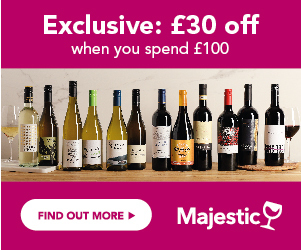 Be inspired with our Deal of the Day or sign up to Price Alerts to never miss your favourite bottle when it goes on sale. Mumm Champagne, with its distinctive red stripe across its white label, has been a key brand and very recognisable label in the UK and throughout the world for decades; however it was the sponsorship deal that was struck over 10 years ago, that really catapulted Mumm into the limelight. As official Champagne sponsor of Formula 1 Racing, its bright packaging is seen on the podium at the end of every F1 race, to help the winners’ celebrate. How much Champagne is wasted is not known, but it’s certainly done a great deal to re-enforce the luxury and celebrity status of the brand. Mumm now occupies the number 4 spot in the hierarchy of Champagne brands in the UK, distributed in both the off and the on trade. With over 220 hectares of vineyards, 25km worth of chalk, underground, storage cellars and over 25 million bottles stored there, Mumm is focussed on continued success in the market. What’s The Background To Mumm? The GH Mumm Champagne house was established later than many, in 1827, when 3 entrepreneurial German brothers saw the opportunity that was happening in Champagne and moved to Reims. They swiftly established the business, purchasing land, establishing vineyards, and a home in Reims. They brought new practices to the Champagne region, being some of the first to set up wine presses in the vineyards, to crush the grapes in their freshest state, and were also one of the first companies to set up contracts with farmers and growers to purchase grapes to crush themselves, rather than juice. Along with many other top Champagne brands, they found favour at the English court, and were awarded their Royal Warrant in the early 20th century. It was in 1876 that the iconic label came to be, as the red sash of the ‘Legion d’Honneur’, the highest of all French honours, became the symbol of the label, with Mumm Champagne thus celebrating the achievements and recognising the most outstanding individuals in France. This gave the brand real and credible national heritage, and was created by Georges Hermann Mumm, whose initials are those of the company today (G H Mumm). The real visionary behind Mumm Champagne was Rene Lalou, who took over the running of the business in 1920, and was at its helm for over 50 years. He reorganised the company, the business and went back to its heritage and roots, acquiring many new ‘grand crus’ vineyards, to focus on Champagne quality. He was a great supporter of modern 20th century art, and forged many relationships for the Mumm brand within the art world. Today Mumm Champagne owns over 220 hectares of vines, with many from the top Premier and grand crus vineyards, with an unusually high predominance of Pinot Noir (78%). What Styles Of Wine Does Mumm Make? Mumm Cordon Rouge NV - the house style, made from a predominance of Pinot Noir, with a strong Chardonnay component and some Pinot Meunier, from top vineyards. The style is ripe, fresh, and lifted, with a smooth, yet full-bodied biscuit edge. Mumm Rose NV - surprisingly full flavoured and deliciously fruity, this Rose is a blend of Pinot Noir and Chardonnay, with the addition of 12% red wine to give a lively colour, and ripe, strawberry scented, juicy flavour. Mumm Demi Sec NV - a well-rounded, off-dry ‘demi-sec’ style, with unusually, 60% Pinot Meunier in the blend, to provide structure and freshness, which is balanced with a slightly higher dosage of sugar, to give a ripe, fruit-driven, soft, an gentle style of Champagne. Mumm Vintage - a blend of predominantly Pinot Noir and some Chardonnay from top ‘crus’ vineyards, this is a classic expression of the riper, full Mumm style, made only in the very best years. Mumm Grand Cru Blanc de Blancs - a very unique Champagne, produced entirely from Chardonnay grapes, grown in Cramant, vineyards that were acquired in the late 19th century. The bottle shape and label hark back to the history and the fine tradition of the wine, which is a pure expression of top quality fruit, with a lower dosage, adding to the vibrant purity of the dry style, and a lower fizz level, due to less pressure in the bottle – supremely elegant, and refined. Mumm Cuvee Lalou - a very special blend to commemorate Rene Lalou, who drove Mumm to success for over 50 years. There had been a special blend created to honour him in the 1960-1980s, and this has now been re-created by the cellar masters and launched in 2007.